Sewing Lamp with C bracket mount. 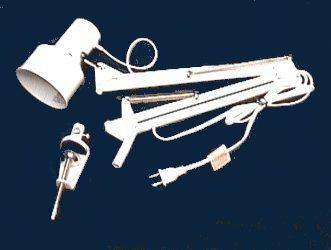 This Deluxe Sewing Light is completely adjustable in every direction and features a porcelain socket, twist on-off switch, heavy-duty shade, and all-steel construction. Provides uniform, high-intensity illumination of the work area. Completely adjustable in many directions. All steelconstruction. Complete with male plug. Oil resistant wiring and easy installation..